It’s not a secret that editing PDFs is impossible without having a special program preinstalled. It can be a problem when you have two or more separate PDFs that you want to combine into one single document. Icecream PDF Split&Merge is an ultimate tool that can do this job for you in a couple of mouse clicks. 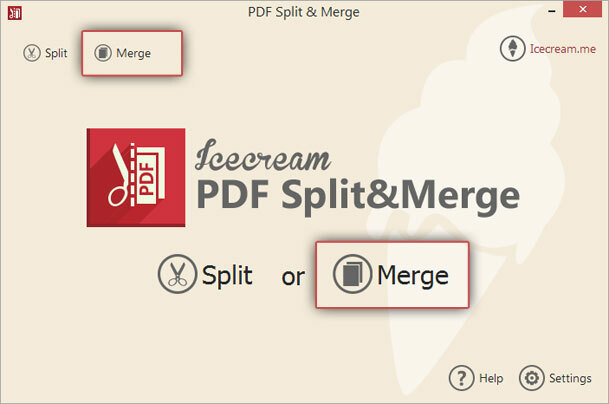 Check this step-by-step tutorial to get an idea of how to use Icecream PDF Split&Merge to merge PDF files and make your PDFs look exactly like you want them to. Download PDF Split&Merge on this site and install it on your computer. It’s a standard process that you can complete in less than a minute. Follow the wizard step by step and once it’s done, go ahead and launch the application. Press on the “Merge” icon in the main window to combine several PDFs into one single file. You can switch between the modes while working with files by pressing on the corresponding tab at the top of the window. Press on the “Add file” icon to open your PC's explorer and import the files from your hard drive. If all the necessary PDFs are stored at the same location on your computer, hold the CTRL key and select multiple files to upload them all simultaneously. Otherwise, upload them one by one by clicking on the “+” button. Alternatively, drag and drop the files into the working area. If you work with password-protected documents, you can enter the password by clicking on “Enter password”. Feel free to skip this step though because the program will ask you to enter the password when you click on the “Merge” button. Anyways, you won’t be able to preview and modify the document until the password is entered. If you don’t know the password, press “Skip” or “Skip all” – in this case, the program will merge all the files except for an encrypted one. But if you don't insert the passwords in the “pages total” area you will only see to sum of decrypted files. 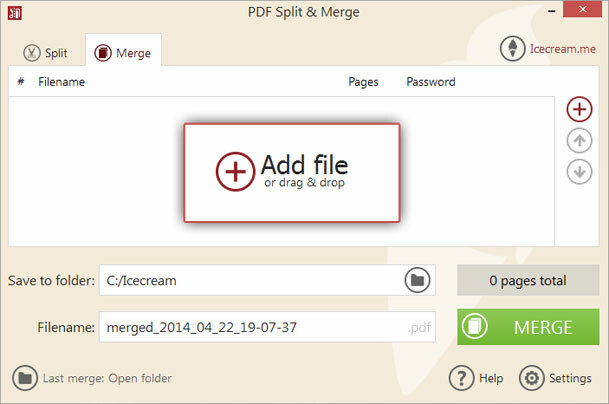 Icecream PDF Split&Merge is capable to merge PDF files into one consequently starting from the first one in the queue. If you want to change the sequence of the files, select one that you want to move and use the direction buttons at the right side to move it up and down. Press “Preview” to make sure the files are queued correctly or click on the recycle bin icon that is on the right to file's name to delete some items from the queue if you want. You can see the number of pages in each document in the chart and the total number of pages of all the files (except for decrypted without the password inserted) in the bottom right above the “Merge” button. Click on the folder icon right under the queue view of files to be merged to specify the output folder for your file. Press “OK” and skip to the next field called “Filename”. Type in the title or leave the default one (which includes the word “merged” and the date). Click on the “Merge” button at the bottom right corner of the window to start merging PDF files. Once that’s done, you’ll be suggested to see the file in the containing folder. After that, you can quit the application or continue working with other files.